Arriving at the impressive gated entrance to the estate, you will enter along the private driveway, which leads you up to the residence itself. An array of exotic plants, trees and shrubs, together with its’ many olive trees, complete the feeling of absolute indulgence, exclusivity and privacy afforded by this immaculate property. The village of Spartia, in the Livathos region of Kefalonia, is famous as a base to many Sea Captains, going back many generations in Kefalonian history, and is the ideal location to explore all of the island and the breathtaking natural beauty that Kefalonia has to offer its’ visitors. Hidden Gem Estate boasts stunning panoramic sea and mountain views to the Southern coastline of Kefalonia, A few minutes from the beautiful beach at Spartia Bay, the “hidden gem” is arranged over 3 floors, has an impressive blend of both traditional and modern amenities and is finished to the very highest of standards. The very best quality materials have been used throughout the residence and all the exquisite detailing is testament indeed to the Artisan craftsmen who worked on this impeccable property. The layout comprises an impressive entrance area leading to the large open lounge which features patio doors to benefit from the wonderful views. A separate dining room and large kitchen area also lead out onto an enclosed BBQ area and covered verandas, a place where guests just sit back, relax and soak up the peace & tranquillity of the ‘Hidden Gem’. The main residence has 5 bedrooms and 4 bathrooms. One bedroom and bathroom is on the main floor. The lower floor encompasses 3 independent ‘suites’ which will accommodate 2 – 4 people in each, thus making the total occupancy for the whole estate an impressive 19 persons. Also on this level, next to the swimming pool, is another BBQ area and an enclosed gazebo with a fully equipped kitchen and seating area. 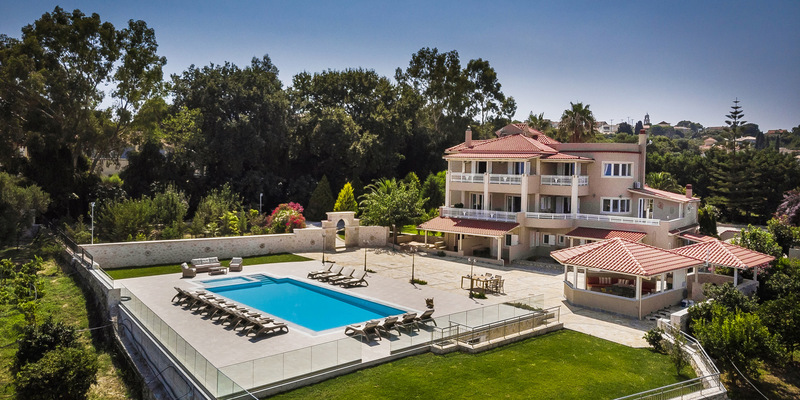 Externally, Hidden Gem Estate continues to immerse our guests in pure luxury with the very spacious garden areas housing the private swimming pool and extensive pool patios, ideal for those lazy hazy summer days and nights which Kefalonia is so very famous for. The grounds of the estate house an abundance of exotica including trees, shrubbery and foliage from all around the world and is meticulously maintained and manicured, adding to the feeling of total extravagance. The views from all angles of the estate are truly breathtaking and the privacy afforded from this substantial property really is second to none.